Maurice Alfred McCanlis was born on June 17, 1906 in Quetta, which was then in India (now in Pakistan) and was educated at Cranleigh School and Oxford University. Starting as a wing three quarter, he converted to full back while at Oxford before settling at centre for Gloucester and England. He played for Gloucester and Gloucestershire from 1928 until 1936 and was capped twice for England in the 1931 Five Nations Championship. Unable to get into the 1925 Oxford University side, McCanlis made his rugby debut for Blackheath in October 1925-26 and played for Kent in the rugby County Championship that season. In 1926-27 and 1927-28 he was a regular for Oxford, first on the wing then at full back and won blues in both years. After the University match, he continued to play for Blackheath each season. He was also a fine cricketer – a fast bowler who won blues in 1926-27-28 and captained Oxford in the 1928 University match. He played cricket for Surrey on a couple of occasions while at Oxford. McCanlis joined Gloucester for the start of the 1928-29 season and made an immediate impact in the centre. In his first game he “cut in between the two opposing centres and rounding Kennedy finished a glorious run over half the length of the field by scoring in a good position.” He played cricket once for Gloucestershire in 1929 and continued to play club cricket. 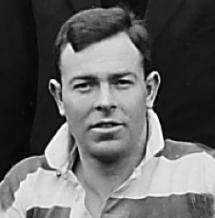 Maurice McCanlis made his name at Gloucester the following season 1929-30 when he scored two tries in their victory over Cardiff – the first at Cardiff since 1897-98. He made his rugby debut for Gloucestershire in the semi-final of the County Championship against Middlesex and was a member of the team that won the Championship by beating Lancashire at Blundellsands. In 1930-31 he scored a try for England against The Rest in the final England trial and went on to play against Wales and Ireland in the Five Nations Championship. He played for the Gloucestershire side that won the Championship against Warwickshire at Kingsholm. In 1931-32 he again played regularly for Gloucester and Gloucestershire and was a member of the Gloucestershire side that won the Championship for the third year running against Durham at Blaydon. Maurice became a schoolmaster at Cheltenham College in 1932 and missed the 1932-33 rugby season. When he returned he was no longer an automatic selection and his appearances for Gloucester were less regular. During that period he also played for Blackheath, Oxford University Greyhounds, Old Cranleighans (at Kingsholm against Gloucester) and the Territorial Army (Lt McCanlis was in charge of the OTC at Cheltenham College). He retired from rugby at the end of 1935-36. In 1938 and 1940 he made a return to first class cricket with a couple of Ranji Trophy appearances for Rajputana, while teaching in India. He retired from Cheltenham College in 1966 and died at Pershore in 1991.